Are you running your business and trying to identify and determine the next steps or where to go with your business? Let me help in clarifying and identifying key patterns and stages of your business to take the next steps. Today, I wanted to share a tool that helped me clear the clutter and get clear with my business and the businesses that I serve. 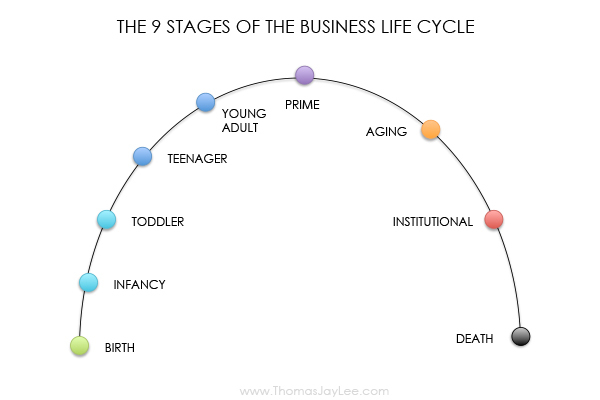 It’s the 9 Stages of the Business Life Cycle. Let’s begin by delving in with identifying each stage along with their characteristics. Birth stage: When your dream becomes a reality and you have launched your business entity. Paperwork is submitted and you’re in the market. Infancy stage: Survival is foremost. You’re getting your name out there, trying to get as many sales as possible, and you, the founder, are the #1 employee of the business. Toddler stage: You’ve landed clients and made some sales, but you now face more challenges. Just like a real toddler, becoming mobile presents many more opportunities to get hurt. You need some guidance at this point so you avoid major pitfalls. Teenage stage: These are the wild years. Money is coming in, but you’re still trying to figure out who you are relative to the market. The downside? You feel like you’re invincible. Sales are booming, everyone is starting to catch on, but when you look at your bank account you have very little in the balance. Young adult stage: This is where you start putting systems and structures in place for the long-term. In a practical sense, you start hiring for key executive roles, like a CEO, CFO, and CMO. You’ll often see a dip in sales at this point because of the adjustments, but in the long term you’ll see your profits rise. Prime stage: Sales are booming and profits are high. If your business was an athlete, it would be like basketball stars Michael Jordan or Kobe Bryant winning all their championships. Aging stage: Your production starts to dip and you’re not able to do what you used to be able to do. Sales decrease, and while profits stay strong because of the structures you have in place, you are starting to become old-hat in the marketplace. Institutional stage: Sales are down, profits are declining, and everyone in the business starts blaming one another. In larger companies, this is the stage where they often go outside for funding just to keep the company alive. This is usually due to a lack of innovation and marketing. Death: The company dissolves and the doors close. RIP. It's great to see businesses grow and get to their prime but the back end of sustaining (keep from aging/institutional) is more critical than the growth in my opinion. To be innovative, does not require the business to be ground breaking thoughts or products (it doesn't hurt if it is though) but it's the simple principle of what or how can you meet the needs of the clients you serve. What can you improve or innovate upon your product or service to best meet the needs of your clients? Is it efficiency? Is it a new color? Next, you must market your innovative product or service. What problem does it solve? Who needs the product or service? How does it work? Call your clients to act. 1. Based on the 9 Stages of Business Development, which stage most accurately describes where you are? 2. What “next steps” do you need to take to move to your business into the next stage? 3. How can I (Tom) help you? Email me at Thomas@ThomasJayLee.com and let me know you worked through this guide. I’ll be happy to connect you to people or resources that may help.